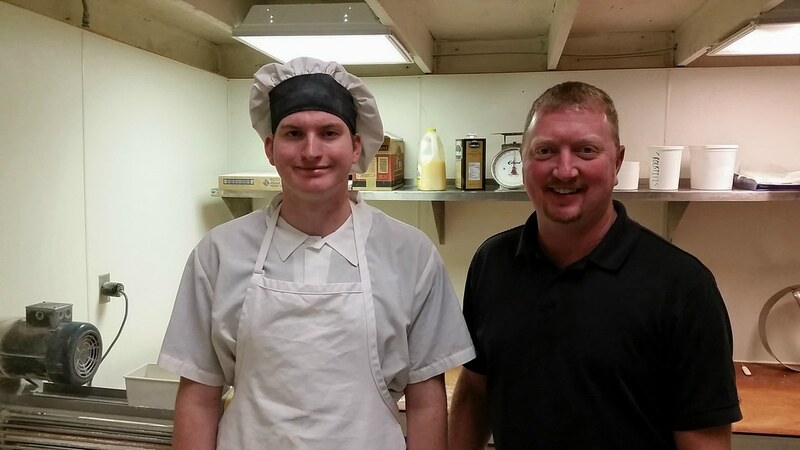 Ian, a YTP student, poses with his supervisor at Pappy’s Pizza in Redmond. The Youth Transition Program partners with schools, Vocational Rehabilitation, and the business community to form partnerships that help students to develop work skills, habits, attitudes, and knowledge that will empower them to have future success in the working world. Employers can make a positive impact on those students, and help connect them to the world of work by providing a variety of work experiences. By building partnerships we can create opportunities for our youth that will invest in skilled workers for tomorrow. The Youth Transition Program serves youth with disabilities statewide. YTP is a partnership between Oregon Vocational Rehabilitation Services, the Oregon Department of Education, the University of Oregon College of Education and local school districts statewide. YTP prepares youth with disabilities for employment or career related postsecondary education or training. Valuable school/community partnerships that truly make a difference. Participation increases the probability that young people will become productive citizens. Development of work experience and job retention skills. Exploring occupations that compliment the students skills and abilities. Develop confidence and self esteem. Receive consistent, individualized support including follow-up after leaving the program. Please contact our district Youth Transition Specialist, Alex Pelaez, to get involved!